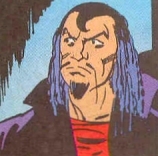 Luciphor aka The Cobra is a character from the Mandrake the Magician comic strip that first appeared in "The Cobra", the very first Mandrake story. The Cobra is Mandrake's most evil and dangerous foe. In a story from 1937, the Cobra was apparently defeated; however, he returned with a vengeance in a story from 1965. This time hiding his face (scarred and disfigured in battle with Mandrake) behind a menacing silver mask. The Cobra's main goal is to acquire one of the two powerful Crystal Cubes which increase mental energy. These are guarded by Mandrake and Theron. In later years, the Cobra abandoned his silver mask as his face had been reconstructed through surgery. The Cobra is sometimes accompanied by his assistant Udd. Mandrake learned that The Cobra's true identity was Luciphor, Theron's oldest son — thus making The Cobra Mandrake's half-brother. 1937 Daily "In the Cobra's Grip"
1967 Daily "The Return of Evil - The Cobra"
1969 Daily "The Cobra Strikes (The College of Magic)"
1974 Daily "The Cobra and the Cube"
1974 Daily "The Search for the Cobra"
1979 Daily "Mandrake's Gangster Gallery"
1992 Daily "The Book of Criminals"
1995 Daily "Pursuit of the Cobra"
2012 Daily "Melody of Doom"
2013 Phantom Sunday "Mandrake's Bon Voyage"
This page was last edited on 25 March 2016, at 23:41.